Strategic Environmental Assessment (SEA) is a broad-based approach to environmental assessment that examines the environmental effects which may be associated with a plan, program or policy proposal and that allows for the incorporation of environmental considerations at the earliest stages of program planning. SEA typically involves a broader-scale environmental assessment (EA) that considers the larger ecological setting, rather than a project-specific environmental assessment that focuses on site-specific issues with defined boundaries. 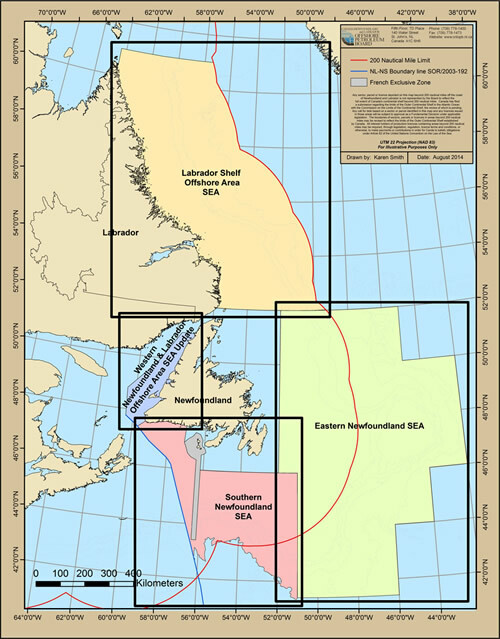 The C-NLOPB decided in 2002 to conduct a SEA of portions of the Newfoundland and Labrador Offshore Area that may have the potential for offshore oil and gas exploration activity but that were not subject to recent SEA nor to recent and substantial site-specific assessments. SEA Reports can be accessed by the following maps by clicking the title found in each area.